3Fish Studios makes original and affordable artwork. The studio was founded in San Francisco when husband-and-wife team Annie Galvin and Eric Rewitzer turned their passion into their business. Annie, a painter, creates iconic, nostalgic artwork, and Eric makes prints of her images using traditional print-making techniques. 3Fish Studios celebrates the imperfections that make things beautiful. 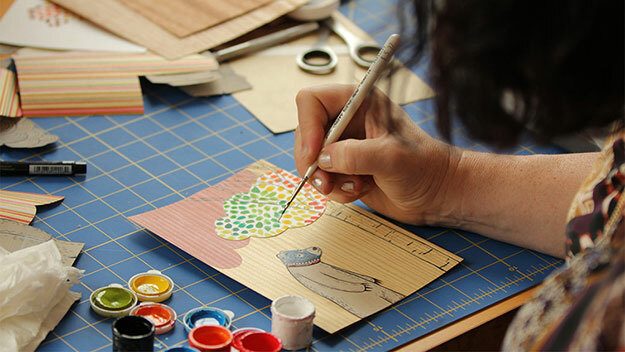 Annie — Well I do small paintings, I draw a lot of girls and bears and Mexican wrestlers. And I also work with a lot of signage, like San Francisco and California signage, just to take that impulse that I have to always be creating and make it into a piece of art that somebody wants to take home and hang on their wall. I really love that. I find it very meditative. I can zone out and hours will fly by. I am just sitting there making my little paintings, I love it. 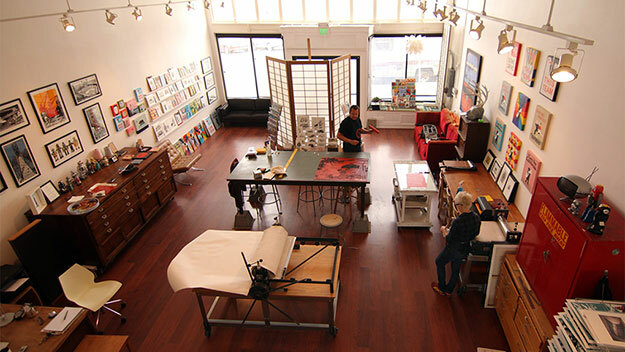 Eric — I am primarily a printmaker, where I take sheets of linoleum and carve them out with Japanese hand-tools. Printmaking in particular is incredibly challenging and rewarding with the efforts that you put forward. There’s so much about it in terms of having to think of the object in reverse; having to carve out different details; and it’s also been a great discipline for me to learn how to resist perfection, which I think is what for me - my process is all about. All the hand-work is really an expression of how I am as an artist and I think it comes out in the work. I think one of the keys to our success has been that we’ve always created original and affordable artwork. We’ve been creating iconic, nostalgic, is that the right word? What we do is we create work that has meaning to us. When we started the business 3FishStudios.com we got the website and that was one of my first orders of business was to put some kind of e-commerce engine on it. Shopify came onto my radar and it’s extremely clean, easy to use interface that kind of fell out of the box. And so we moved over to Shopify about four or five years ago, and it has been great for us. It does the job, it allows us to process credit cards from all around the world, and I keep on getting all these new features and tools that we need to integrate, so we’ve been very happy with it. It’s really helped us grow our business. Work hard — I think that's always the difference between a lot of opportunities. You just got to tuck in and you got to do it. This was no small effort to try to make this happen but again the rewards are there for it. This business kind of makes us think differently about retirement. I mean, we’ll always be doing this. I think when we are 75 we will still be doing this. Maybe our lines will be a little shakier, but it will always be something. I don’t think I will ever lose a love of doing it and owning our own business really makes that special.